Spike Missile Deal Halted Again: When Will India Stop Financing Israeli Occupation? The missile is being developed by the Israeli government-owned Rafael Systems, which advertises its weapons and military hardware as ‘field-tested’, implying their deployment in killing and maiming Palestinians as a selling point. One of the most high-profile arms deal between India and Israel is once again in jeopardy, even as the list of weapons’ contracts between the two states continues to grow. The $500 million Spike anti-tank missile deal has reportedly been delayed as the missile has failed to perform in high temperature conditions, as demanded by India. This comes a year after the Spike missile deal was cancelled in favour of developing indigenous defence technology, which was later claimed to be ‘back on the table’ by Israel’s Prime Minister Benjamin Netanyahu during his January 2018 trip to India. The deal evidently holds considerable value for Israel and the PR (public relations) around its defence technology. Reports also suggest that India is inclined to produce these missiles domestically and may cancel the deal altogether. 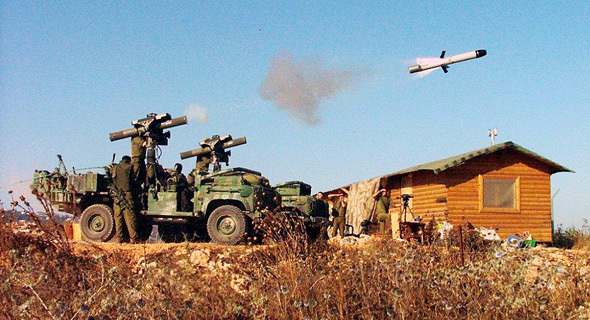 The Spike Anti-Tank Guided Missile is developed by Israeli government owned Rafael Advanced Defence Systems. In India, Rafael has opened a missile sub-systems facilitywith Kalyani Strategic Systems Limited in a joint venture. This facility, located in Hyderabad, was commissioned for the production of these missiles and might produce a small consignment while a larger share would go to Defence Research and Development Organisation (DRDO), the Indian public sector defence manufacturing agency. Despite arguments by former DRDO directors favouring Israeli technology over enhancing DRDO’s capacities, and larger attempts by the Bharatiya Janata Party (BJP) government to advance the corporate sector in defence production, at the cost of PSUs, DRDO has consistently shown that in certain areas of defence manufacturing, its technology and skills are highly sophisticated. Experts note that the BrahMos missile range, for instance, developed as a joint venture between DRDO and Russia’s state-owned NPO Mashinostroyeniya, has evolved cutting edge technology and products over the years. The Brahmos supersonic cruise missile, the fastest in the world, was test fired successfully last year. Early this month, the Defence Acquisition Council gave approval for these missiles to be procured by the Indian Navy. The story of the BJP-led National Democratic Alliance government giving Israeli defence companies precedence over DRDO is not new. In 2006, the Central Bureau of Investigation filed an FIR in the case of the Barak missile systems deal of 2000, on allegations of corruption involving high-ranking BJP ministers at the time, unknown officials of Israeli Aircraft Industries (IAI) and businessmen acting as middlemen in the deal. Barak-1 Anti-Missile Defence System was developed by state-owned Israel Aircraft Industries Ltd. (IAI) and Rafael Advanced Defence Systems, its subsidiary. This deal, which was initiated in 1995, was questioned at various points by DRDO officials as the indigenous Trishul missiles could provide the same functions as Barak-1. Defence acquisitions demand DRDO’s concurrence. As per the CBI FIR, “DRDO never concurred to the import option of the Barak AMD system during 1998-99”. Eventually, although the CBI closed the case on the basis of lack of evidence, IAI was blacklisted and the Ministry of Defence cleared this deal only in 2013. Israeli military industrial complex is replete with corruption. The revolving door between Israeli forces and the military industry allows for ex-officials to be absorbed into the military industrial complex. These corruption cases range from top IAI officials, who were formerly in the Israeli Occupying Forces, to Netanyahu, himself. Israeli forces have been imposing the occupation, apartheid and colonisation of Palestinian lands and people with shocking impunity for the past 70 years. This year alone, they have killed over 200 people demanding their right to return home in the besieged Gaza strip. To add to this, Israel advertises its weapons and military hardware as ‘field-tested’, implying that their deployment in killing and maiming Palestinians is a selling point. Already, the technology used to suppress the Great Return march in Gaza is being promoted by Israeli defence companies. Israel has been able to carry out this decades’ long crime because of the support it receives from other states. The tidal shift in India’s foreign policy towards Israel, under the BJP regime, is perhaps most strongly reflected in the deepening of defence ties. India buys 50% of Israel’s weapons exports. Along with the hardware, India is also bringing in Israeli methodology of repression, especially to scuttle political struggles. This burgeoning collaboration helps sustain and finance Israel’s occupation of Palestinian lands and people. It also contributes to militarisation of Indian public life. The Israeli PR machinery is always on overdrive. The traction it receives through high-profile military deals is crucial for keeping its military industrial complex well-oiled. This is reflected in the diplomatic scampering that went in after the Spike Missile deal was initially cancelled. An important question in this regard for the Indian civil society, in my view, is how can India’s state exchequer be squandered on running Israeli PR, at the cost of indigenous defence technology? An even more fundamental point is, there is no moral justification for letting the funnelling of public funds for entrenching Israeli occupation of Palestine and further militarisation of our public life in turn go unquestioned. The Palestinian-led Boycott, Divestment and Sanctions movement has called for a military embargo on Israel, a demand that is fast gaining popularity. Amnesty International has also called for it in light of the killings in Gaza in the Great Return March. UK Labour party, in its recent annual conference, passed a resolution calling for freezing arms sales to Israel. Ending India’s complicity with Israeli occupation and resisting state militarism in India requires us to build momentum for this demand too.